Indy in 2011 for the DCI World Championships. Representatives from a number of West Coast drum corps, including those associated with Drum Corps International's World, Open and All-Age classes, met Sunday, Oct. 24 in Cupertino, Calif. for an annually scheduled directors' meeting. During the session, Ray Mar (Mandarins), Stuart Pompel (Pacific Crest), David Gibbs (Blue Devils), Jeff Fiedler (Santa Clara Vanguard), Mark Richardson (The Academy) and Greg Gilman (Renegades) agreed to remain on the Pacific Division Advisory Committee. Fiedler was elected as new chairman of the group. The committee oversees operation of the association of western-based corps and assists in the development of new corps and competitive events. "I'm looking forward to working with my colleagues from the Pacific Division to continue to grow the drum corps activity in the western region of the country," said Fiedler. "The spirit of cooperation among the members of the Pacific Division is tremendous, and our goal is to continue to build on the momentum of the past few seasons as we prepare for 2011 and beyond." 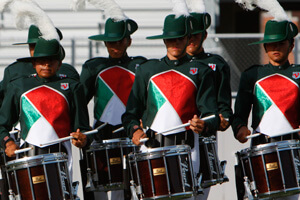 Attendees began to solidify the western portion of the schedule for the 2011 Drum Corps International Tour. Three of nine Pacific Open Class corps are currently making plans to attend the 2011 DCI World Championships in Indianapolis, including last season's first- and second-place groups Blue Devils B and Oregon Crusaders. Returning to Indy after a year off from World Championships participation in 2010 will be the Santa Clara Vanguard Cadets. For those corps who will not be traveling as extensively in the coming summer, the committee also discussed preliminary plans to host a late season Open Class and All-Age championship for Pacific Division member organizations. "The Northwest schedule is looking strong for the summer of 2011," said DCI Executive Director Dan Acheson who was in attendance at the meeting. "The directors remain committed to maintaining a strong division."